As were in the last 45 minutes of 2005, I'd like to wish a Happy New Year to all my friends and readers. May 2006 be a better year than 2005. All the best to all of you for the year to come. On top of that, Democrats attending the regular State Central Committee meeting last Wednesday criticized Lieberman [due to his failure to toe the anti-war party line] and called for support for a primary challenge against him at the party's convention in May. "I speak to Democratic state senators all the time. They always said, 'Joe is a rat, but he's our rat.' Now they are saying, 'Joe's a rat and we can't afford to have him at the top of our ticket,'" said Democrat Keith Crane of Branford, Conn. "I think Joe is going to get a rude awakening in May." There's even more in the article so read it in full. So much for the Democrats' famous tolerance for dissent. If the Democrats kep this trend to push further leftwards with this anti-war, September 10th mindset they'll continue down the path to irrelevance, right when we could use a strong and principled opposition party that actually takes national security seriously. The FBI has confirmed that they Monitored Muslim Sites for Radiation(via Foxnews). WASHINGTON — A classified radiation monitoring program, conducted without warrants, has targeted private U.S. property in an effort to prevent an Al Qaeda attack, federal law enforcement officials confirmed Friday. While declining to provide details including the number of cities and sites monitored, the officials said the air monitoring took place since the Sept. 11 attacks and from publicly accessible areas — which they said made warrants and court orders unnecessary. Since monitoring the air in a public place is permissible there is nothing illegal with this process. Especially considering that this was monitoring for the purpose of finding harmful substances ie radioactive materials, there should be no surprise that this is necessary in this day and age of Islamist terrorists. Now, of course, there should be an investigation as to who leaked the existence of this classified program to the US News and World Report. I daresay the revelation of this program is certainly more damaging than the outing of the non-covert Plame. Sexton, 55, said he noticed that members of a political group -- the Eastside Community Slate -- had brought voters to the election headquarters with what he later heard was an arrangement to hire them as poll workers the next day. Sexton said it looked like they were being paid to cast ballots for the slate's candidates. Sexton told police and the Free Press he overheard two voters discussing what he believed were plans to collect money for their votes. "It's a hundred, right?" Sexton described one man as saying to another in line. Sexton said the other man replied, "No, it's $75, and I will be the first one here at 5:30 to collect." Sexton said the Eastside Slate worker made "a beeline" to voters as they left the elections building and asked them: "Now you voted my ballot, right? You voted my slate?" They answered yes, Sexton said, and the slate worker collected slips of paper indicating that each person had voted. It will be interesting to see if this is investigated or not, as the police report of the incident currently says "Disposition: Not a crime"
Perhaps next time the Eastside Slate, like Caesar's wife, should act in a way above suspicion, as this set of events IS suspicious. The meeting was disrupted by an opposition group, By Any Means Necessary, which recruited students from Cody, Cass Tech, Crockett and Mumford high schools in Detroit and Oak Park High School to swarm the meeting and keep the board from voting. Students chanted "no voter fraud" and "they say Jim Crow, we say hell no," danced on chair seats and made obscene gestures at the board. At one point, many of the protesters rushed toward the board members, overturning a testimony table. Lansing police officers were called to restore order. The board recessed for lunch, returned to a different room at the Lansing Center 90 minutes later and managed to vote on the issue over shouts from a smaller group of protesters. Republican board members DeGrow and Lyn Bankes voted in favor. Democrat Paul Mitchell voted no and Democrat Doyle O'Connor did not vote. Mitchell, an African-American, earlier had said he was prepared to vote to certify, and tried to explain that to the angry crowd above shouts such as "be a black man about it." So a bunch of thugs managed to disrupt the electoral process and according to the Detroit News only one 17 year old was arrested for disorderly conduct. Impressive job BAMN, using mob action and intimidation to prevent people from even having the opportunity to vote on the issue of affirmative action and the chance that the people might vote for something you don't like. Hmm, I do believe a bunch of people in white sheets used similar despicable tactics back in the recent past to stop others from voting. A 35-year-old Jordanian man has pleaded guilty in federal court in Washington, D.C., to helping a Detroit-based ring smuggle more than 200 illegal immigrants from the Middle East into the United States. Thaer Omran Ismail Asaifi, also known as Abu Harp, pleaded guilty Monday to participating in a conspiracy prosecutors say they believe was headed by his wife, Neeran Hakim Zaia, 51, of Sterling Heights from early 2001 through September 2004. Asaifi said he helped smuggle scores of illegal immigrants to the United States. Immigration and Customs Enforcement, which conducted a three-year undercover investigation code-named Operation Tortuga, said Asaifi, his wife and others illegally smuggled Iraqi and Jordanian nationals into the country through Equador and Peru. And who were the buyers? Wilkey said she sold the documents to Daher Al-Mayahi, 37, of Dearborn Heights and Ali Hawil, 34 of Dearborn, who also have pleaded guilty in the case and are scheduled for sentencing Wednesday by U.S. District Judge Arthur Tarnow. Al-Mayahi is an Iraqi national and permanent U.S. resident. Hawil is a citizen of Guinea and is facing deportation. The men admitted bringing illegal immigrants from the East Coast to Michigan to obtain driver's licenses or identification documents as a first step toward receiving immigrant visas and other documents so they could stay in the United States. Not to mention vote, travel with an identity off of any watch list and do various other activities. Federal authorities, including U.S. Immigration and Customs Enforcement, have been cracking down on driver's license fraud because the licenses can be used for immigration, bank and mortgage fraud; identity theft and terrorism. You don't say. One hopes the authorities have extensivley questioned the men and checked for terrorist ties and the whereabout sof asll those provided with the falke drivers licenses and ID cards. Source: The Vancouver Sun MONTREAL -- Prime Minister Paul Martin will propose a ban on most handguns in Canada, CanWest News Service has learned. Sources say Martin, who will make the election campaign announcement this morning, wants to choke off the supply of handguns in this country, particularly guns brought into the country illegally and those sold on the black market. There will be some exemptions, including maintaining the right for police to carry handguns. The prime minister is also expected to announce a significant increase in resources for police to deal with the ban. "I came to Ottawa with the firm belief that the only people in this country who should have guns are police officers and soldiers." Maclean's "Taking Aim on Guns", April 25, 1994, page 12. Nice to see the Liberals are carrying out his beliefs. This is of course an election campaign ploy on the part of the Liberals, whose prior firearm registration boondogle will likely cost over a billion dollars before it is functioning - far more than the $2 million price tag they stated it would cost. With rising crime, a corruption scandal in government, what else would the Liberals do to earn cheap political points with their base? So much for the Liberal Party's previous promises that Registration would not lead to confiscation and their portraying those who said it would lead to confiscation as being alarmist. A potential find of vast historical significance. Israeli archaeologist Eilat Mazar believes the evidence she has uncovered during months of excavation and biblical comparison points to an extraordinary discovery. She believes she has found the palace of King David, the poet-warrior who the Bible says consolidated the ancient Jewish kingdom around the 10th century B.C. and expanded its borders to encompass the Land of Israel. If corroborative evidence is found confirming that this is King David's Palace, this could literally be the find of the century. As I mentioned in In The Midst of Layoffs, Detroit Police Consider Buying A $743K APC , Detroit should look for a surplus armored vehiucle rather than spending almost three quarters of a million dollars for a shiny new one with all the bells and whistles. Indeed they could get a surplus armored vehicle for - FREE. Warren-based TACOM, the U.S. Army's Tank-automotive and Armaments Command, in June 2004 doled out, free, three armored personnel carriers to the Wayne, Oakland and Macomb County sheriff departments. The departments are required to periodically report back to TACOM on the reliability of the technology used in the vehicle, which can carry up to 13 officers, and perform any needed maintenance. The Detroit Police Department has not requested a free Army tank (emphasis added), but would likely be a good candidate to receive one, said Don Jarosz, deputy public affairs officer for TACOM. The Army tanks can cost as much as $475,000. Literal Barrage links to a very humorous posting over at Slashdot regarding the claimed escaper of Navy Dolphins from New Orleans. Sound a little fishy to me. What could be the porpoise of arming these creatures? Before we starting carping on the ineptitude of our navy, I think we should more carefully exsalmon the situation - they may not be solely at fault. Perhaps Katrina is just a red herring here, and these killer dolphins have been floundering around for months. Maybe some deranged fool let them loose just for the halibut. Whoever is responsible should have their head on a pike. To which I could only reply: Frankly my dear scallop, I don't give a clam who is responsible. Its a crappie situation and the story just smelts fishy to me. From the Macomb Daily Cousins accused of 'dueling'. Two Mount Clemens male cousins will be charged with the rarely implemented charge -- "dueling -- engaging in/issuing challenge" under state law -- for a fight Monday afternoon outside their home in which one of them suffered a stab wound to the stomach. The offense, which carries a maximum penalty of 10 years in prison, was penned in 1846. "The 1800s are alive and well in Mount Clemens," quipped Dean Alan, chief of the Macomb County Prosecutor's Office warrants division, which approved the warrant Tuesday. "All we need are the mineral baths." Alan said he believes it's the first time the charge has been rendered in Macomb, although Sheriff Mark Hackel said he vaguely recalls a possible dueling charge many years ago. Hackel said he wholeheartedly supports the unusual charge. In the incident, the two men who reside in the same home on Walnut Street with other relatives disagreed over a $30 debt. Wielding a knife, the older cousin confronted the younger cousin, who retrieved a knife and accepted the challenge, the sheriff said. This coin is a gold Solidus weighing 4.37 grams of the Eastern Roman Emperor Theodosius II. on the Obverse of the coin, a Helmeted and cuirassed bust of the Emperor is facing front, holding spear and shield. 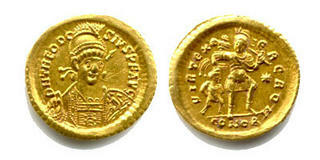 On the Reverse: VIRTEXERCRO, Emperor stands facing, head left, holding Barbarian. Struck in Constantinople in 441 AD. The reverse alludes to the Emperor's military virtues, an important propaganda device for retaining the loyalty of the army and to keep the citizens assured that the Emperor would keep the barbarian hordes in check. The coin is in Extremely Fine condition. Theodosius II is mostly known today as being the issuer of the Theodosian Code -- the Codex Theodosianus in 438 CE. After being issued in the East it was adopted by the Emperor of the West, Valentinian III. The Codex codified the Roman Law from Constantine forward and is still a strong influence on modern Civil Law that is practiced in much of Europe, Quebec and Louisiana (as opposed to common law) even today. A copy of the Theodosian Code can be found in the original Latin online. Unfortunately, I've been unable to find an available a full English translation on the web. The code provides a wealth of information for the social and legal historian for the development of laws and the society in which the code was formed. The code was later superceded by the Justinian Code. This impressive solidus is for sale at Amphora Coins for $750.00. A Shekel Trifecta - Coins, Law and Commentary all in one post! While in the process of laying off 150 Police officers due to budget constraints in a city that is precariously getting closer to falling into a receivership, the Detroit Police is planning to use $743,000 in drug forfeiture money to buy an Urban Assault Vehicle. urban assault vehicle ... can traverse rivers, is resistant to landmines and is equipped with periscopes. There are not any known minefields in Detroit - at least not literally, and really not that many water obstacles either, especially on an urban drug raid, unless the druggies are doing new home makeovers with moats. The Detroit City Council is expected today to approve purchasing "The Commander" general-purpose vehicle for use in executing drug raids. It also could be used in case of a terrorist attack or a natural disaster. Does the City really need to spend almost 3/4 of a million dollars on a new assault vehicle when there are plenty of surplus armored personnel carriers that can be purchased for much, much less? In light of laying off officers in a high-crime city, The Detroit Police would be better off not buying the Rolls Royce of assault vehicles and instead buying some surplus armor and keeping more Police on the Street. First, Many Thanks to Universal Pictures and Grace Hill Media for arranging for Bloggers to attend the preview of Serenity. In fact, Grace Hill Media even had a reserved section of good seats in the theater for the reviewers. I saw the 7:00 pm preview screening at the Uptown Palladium in Birmingham, Michigan (the Detroit location). In addition to a few Bloggers, the theater was almost full with people who had been given some preview passes. First, if you’re a Firefly fan, Serenity will not disappoint. All the panache, humor, action and rich characters that made Firefly such a great series are present in the movie. The audience laughed and got the jokes and there was even some cheering in the theater when the Serenity crew did something particularly amazing (Sorry, I won’t spoil it for you – go see the movie for yourself to find out why). If you’ve never seen Firefly, fear not. My wife, who had never seen Firefly, and is not a sci-fi fan did enjoy the movie. She did not expect some of the violence, especially the startling flashback action during the Reaver scenes. Other than that, she did enjoy it and had no trouble understanding the 5 W’s (Who, What, When, Where and Why) of the movie, and the movie flawlessly works in elements from the series and immerses the viewer in the Firefly universe. My wife did comment that the movie could have used a bit more romance and a little less of the the quick-flash scens but otherwise she enjoyed the movie. One, the sound seemed to be ill-mixed and overly loud. At times the music or action sounds were very very loud, often making the voices hard to hear. This may have been due to the theaters sound settings however. The only other downside to the film is that, as a Firefly fan, a certain character(s) (I’ll not spoil it by saying who) is going to die in the film, which may make transitioning the movie back to a television series difficult. Now the movie may be used as an “end” and the series may take up where Firefly left off, or it could potentially progress from this point in a new direction as not all threads were tidily cleaned up, leaving room for many great adventures to come. This does not detract from the quality of the movie in any way, but certainly may shock some of the Firefly fans out there. Serenity has it all – strong characters, drama, suspense, an excellent plot, moral dilemmas and moral answers, humor and action. Oh yes, If you’ve seen Firefly and remember River saying “No power in the ‘verse can stop me” – You’ll see in this film that she was right. River rocks. Go see Serenity, it will not disappoint either the Firefly die hard or those who have yet to enjoy the experience. Intersetng if the identification is correct, the tomb is near a "small village of Poros on the southeast coast of Kefalonia". Basing the identification on finding a broach in the tomb match a description in Homer's Odyseey is tempting, but I'd like to see more proof, including some further archeological date comnfirmation and further analysis of the find. Still, this would be an amazing find if it checks out. Regardless of whether it is Odysseus or not, finding an ancient burial complex is a significant discovery. I've been confirmed as a blogger/reviewer to blog on the new Movie Serenity and will be seeing it on Tuesday. Serenity is set in the Firefly universe with the same cast and characters. As Firefly was fantastic, I expect Serenity to be at least as good. The trailer for the movie if its any indication, makes me beleive the movie will more than live up to the series and hopefully spur the continutation of the series onto Television. 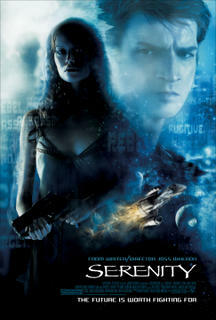 For more info on the film see the Serenity The Movie Site, which has artwork, trailers and more. I'll have my review of the film up shortly after I've seen it. In a strange decision nullifying much of the protection of the "firemen's rule" (which prevents Firemen and Police from suing the person seeking help for injuries they receive while responding to assist that person. The Michigan Court of Appeals ruled that a bar calling for police to help eject a drunk patron can be sued under the Dram Shop rule for injuries to the officers that are casued when they try to eject the person. There are several practical problems with the ruling and the weakening of the firefighters rule. It creates an incentive for bar owners not to call the police to deal with dangerous patrons, which puts everyone else in the bar at risk. By limiting the firefighters rule, it invites more lawsuits that may make homeowners and other property owners liable to suit for calling the police or fire departments, which would make them hesitate to do so. creates an unhealthy, uneven relationship between the people and their government. Under the governmental immunity rule, citizens are not allowed to sue the government for its mistakes, but now government employees can sue citizens for injuries the employees suffer in the course of their official duties. There's something wrong with this picture. Exactly so. As the Detroit News recommends, the Michigan Supreme Court should reverse this flawed decision. I received this from someone who is an otherwise reasonable and smart individual who sadly seems to be suffering from BDS (Bush Derangement Syndrome). While I do not find the Federal Government's response to this disaster to be perfect (Its the Federal Government people, who really expects it to respond perfectly to anything? ), the calumnies and falsehoods in Mr. Moore's letter, so keeping in his typical style need to be addressed. That's President Bush to you, regardless of how you may feel about the man, at least respect the office. And yes, While President, Clinton should have likewise been addressed as President Clinton. Of course, you don't want to mention the buses because it could be hard to blame that on the President now wouldn't it. Sorry you can return to your regularly scheduled Bush-bashing now. Obviously Moore knows little of how the Constitution and our Federal system of Government works...did he go to public school in Flint or something? The Louisana National Gurad are under the command of -- yes you guessed it --..the Louisiana Governor! Only about 350 of Louisiana’s National Guardsmen are in Iraq and those that are are part of an actual combat brigade. That left Govenor Blanco 8,000 people . Where is your citicism of her? Maybe you would like to ask Ms. Blanco why she hesitiated for two days? ignore and smear. You sure showed her! Nevermind that the feds responded in force within 3 days. It took 9 days to respond to Hurricane Andrew, so Bush has sped up the federal response by 300%. Nermind that Bush had already declared a state of emergency before the sotrm hit. heck, nevermind that it was the mayor's delay in declaring an evacuation and the Governor's delay in calling for aid and federal asssitance that compounded the problem. nevermind that the governor has still ot ceeded fuill authority over to the Federal government to manage the crisis. Really a lack of money - Not according to the Washington Post In Katrina's wake, Louisiana politicians and other critics have complained about paltry funding for the Army Corps in general and Louisiana projects in particular. But over the five years of President Bush's administration, Louisiana has received far more money for Corps civil works projects than any other state, about $1.9 billion; California was a distant second with less than $1.4 billion, even though its population is more than seven times as large. Much of that Louisiana money was spent to try to keep low-lying New Orleans dry. But hundreds of millions of dollars have gone to unrelated water projects demanded by the state's congressional delegation and approved by the Corps, often after economic analyses that turned out to be inaccurate. Despite a series of independent investigations criticizing Army Corps construction projects as wasteful pork-barrel spending, Louisiana's representatives have kept bringing home the bacon. . . .
Pam Dashiell, president of the Holy Cross Neighborhood Association, remembers holding a protest against the lock four years ago -- right where the levee broke Aug. 30. Now she's holed up with her family in a St. Louis hotel, and her neighborhood is underwater. "Our politicians never cared half as much about protecting us as they cared about pork," Dashiell said. Sorry you can return to your regularly scheduled Bush-bashing now. Yes, and if he landed there you would have castigated him for Grandstanding, just as you are now castigating him for visitng New York after 9/11. You really can't have it both ways. Never mind that the Director of the US National Hurricane CenterDirector of the US National Hurricane Center "uunder questioning by members of a US Senate subcommittee, he shrugged off suggestions that global warming played a role. Mr Mayfield said the increased activity was a natural cycle in the Atlantic Ocean that fluctuated every 25 to 40 years. warned the nation yesterday. Never mind, keep to your Kyoto and global warming chicken little fantasies and return to your Bush bashing. -- to do with this! Lets of course not mention the fact that it was the Lousiana Government (hat tip wuzzademthat prevented the Red Cross from entering New Orleans and providing relief supplies and food and water to the Superdome. Should we say the Democrat Governor of Louisiana prevented supllies from getting there because of race? Let's also not forget to mention that the Federal Response had the same dealys as that under the Clinton Administration in dealing with Hurricane Andrew...and Katrina was a much worse storm affecting a much greater area. The Response is flawed, but to blame it on racism is missing the simple answer of everyday bureaucratic incompetence and the impossibility of a centralized response to a disaster stretching over a land area the size of the United Kingdom. An Italian judge has ordered the arrest of 13 CIA agents for allegedly helping deport an imam to Egypt as part of U.S. anti-terrorism efforts, an Italian official familiar with the investigation said Friday. Omar was believed to have fought with jihadists in Afghanistan and Bosnia, and prosecutors were seeking evidence against him before his disappearance, according to a report last year in La Repubblica newspaper, which cited intelligence officials. Nice to see even the Associated Press is no longer operating under the pretense that "jihad" is merely a peaceful internal struggle and "jihadists" are merely the peaceful internal strugglers. Alternatively this was a slip in a desperate manuever to avoid labelling Omar with the dreaded appellation of "terrorist". As part of Mayor Kilpatrick's budget slashing attempts to reduce Detroit's mammoth $300 million deficit, the Mayor is proposing a 2% tax on Fast Food sales. This proposal will likely earn him kudos from such sources as the Center for Science in the Public Interest and other groups that feel that Big Macs and the like are the roots of all evil, or at least obesity. But for most people, the move is just one more transparant attempt to further tax the residents and visitors to the City of Detroit to support a bloated and expensive City Government that provides services so poorly that Detroit continues to loose population as people gather the werewithal to get out. How many cheeseburgers will it take to pay for the mayor's Navigator?" Marshell said. Kilpatrick was recently embroiled in a controversy surrounding a Lincoln Navigator leased to the city for more than $24,000, allegedly for use by the mayor's wife. "He's the hip-hop mayor, and he wants a 2 percent tax on cheeseburgers? It's not going to happen. "People will remember this when it's time to vote," Marshell said. How long it will take other cities to jump on this scheme as a way for raising revenue raising and pushing an agenda is unknown. The Detroit Free Press Editorial is up in arms that the proposed Michigan legislation permitting early vpoting requires that those voting must show some form of government issued picture identification. While it's true that a huge majority of people have photo ID these days, there will always be some people who don't -- and they don't deserve to be disenfranchised no matter when or how they vote. For elderly people who no longer maintain a driver's license but still might choose this option over filling out an absentee ballot at home, it would be particularly insulting. For others, the $10 fee for a state personal identification card may be a burden and can amount to the equivalent of an illegal poll tax. Wow, what a specious argument! The Elderly might be insulted by having to show ID, and being made to purchase such id could be an illegal poll tax. Nonesense. Apparenlty the Freep concern for people without ID "don't deserve to be disenfranchised no matter when or how they vote" must extend to felons, ilegals and people voting multiple times in terms of when or how theyt might vote. The right to vote is a precious right, a safeguard and basis for our system of govvernment and reserved for citizens and non-felons to use -- ONCE PER ELECTION. Surely the Detroit Free press ought to be in favor of this minimal requirement of picture identification, which helps protect this cherished right. The City of Detroit has had an umarked Police Car either misplaced or stolen. It has likely turned up being used by criminals to impersonate police. Detroit police officials are searching for a 2001 black Crown Victoria that may have been used in a Friday robbery. Cops are paying special attention to this case: The missing vehicle is an unmarked police car. Police spokesman James Tate said the vehicle, with the license plate 580X24, disappeared between March 16 and March 21 from its parking spot at . . . outside of Police Department headquarters. Since then it has apparently been used by criminals to pull people over and steal their wallets. Not good. The public was finally informed about the theft of the car on Monday April 4, after the robbery on Friday. The article in Reason online titled Artifact: Idol Hour by Charles Paul Freund shows a picture of wooden statutes that have been restored after being damaged by the Taliban in 2001. The items had been safe in private collections, but in the museum they became easy targets for destruction by the fundamentalist regime of the Taliban. Many have likely been destroyed beyond repair. Yet another reason why all antiquities should certainly not be housed in government museums where they can be easily targeted for destruction, not to mention theft or defacement. Unlike the Japanese, we have Arabs in the US, including citizens clearly supporting terrorism and jihad against the United States. Mr. Jayyousi is merely the latest in a great number of such. Considering that Korematsu is still on the books activitiesd such as those conducted by him and his ilk are not exactly the brightest course of action. While exclusion and internment were reprehensbile when applied against the loyal Japanese Americans, at some point the American public may become less tolerant and demand such action against those who clearly are harmful and disloyal and represent a clear and present danger today. As reported in the Lansing State Journal, Fred Korematsu Dies at Age 86. Korematsu was the titular appellant in Korematsu v. United States, the case which upheld the exclusion of Japanese and Japanese-Americans from the West Coast during World War II. The Korematsu decision is still good law today.